The assignment: Cortex's mission was to create an easy-to-use interactive experience that would analyze one's heat signature in order to attribute a percentage of overall heat. This percentage was then transformed in Sports-Experts savings for the participant to appreciate their active efforts. 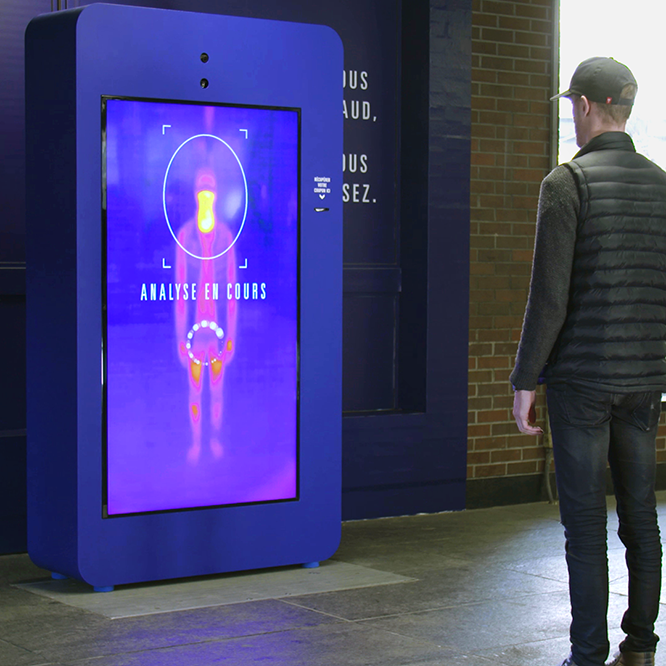 Sports Experts and the Rethink agency called upon the innovation capabilities of Cortex to create an interactive experience that would encourage physical activity. Cortex's mission was to create an easy-to-use interactive experience that would analyze one's heat signature in order to attribute a percentage of overall heat. This percentage was then transformed in Sports-Experts savings for the participant to appreciate their active efforts. Cortex took care of the technical aspects of the experience by integrating a FLIR camera sensor and then interpreting the data to evaluate the heat signature. Cortex also took care of the installation and support during the day of the event on location in Montreal's Metro. The participants loved their experience. The promotional video rapidly reach millions of views and was shared thousands of times. The event has even been featured in international media. The Clio Gala aims to celebrate the most creative companies worldwide. Less than 5% of all entries receive a statue, and less than 1% receive a Gold Clio.